･ When getting a ticket at the station, please be sure to show the "Booking Confirmation" sent at the time of reservation completion. If you can't show this, we'll sometimes sell at the purchase price (¥12,000) at the station. Step 2. After entering in Japan, present the MCO with a passport at exchange locations, fill out an application with necessary details, and exchange for Hiroshima-Yamaguchi Area Pass. Step 1. Book Hiroshima-Yamaguchi Area Pass online, receive Booking Confirmation e-mail containing reservation number, and print out the e-mail. Step 3. 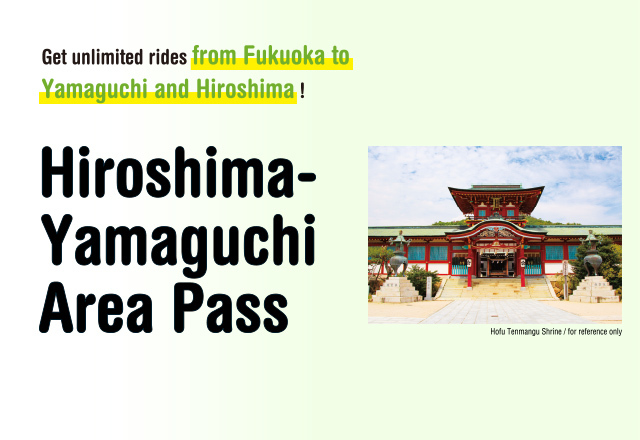 Pay for Hiroshima-Yamaguchi Area Pass by cash or credit card. Step 2. Purchase Hiroshima-Yamaguchi Area Pass by cash or credit card. 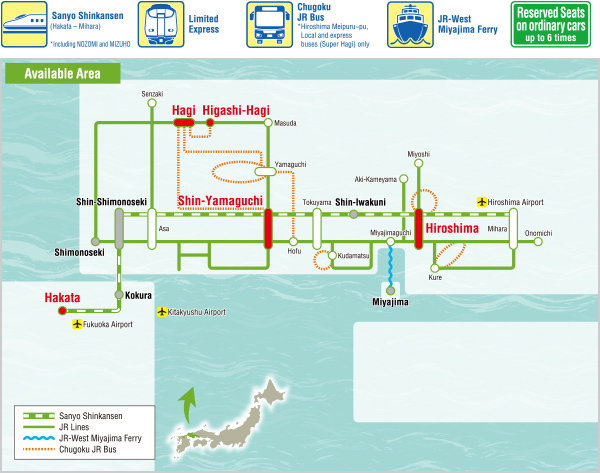 Hiroshima-Yamaguchi Area Pass is usable. * 1 First Class (Green)/Sleeper Tickets and separate Express Tickets are required. * 2 Separate Express Tickets are required. * 3 Separate First Class (Green) Tickets for Local Services are required. * 4 Separate Reserved Seat Tickets are required. * 5 Separate charges will apply if using carriages / trains that require numbered or liner tickets. 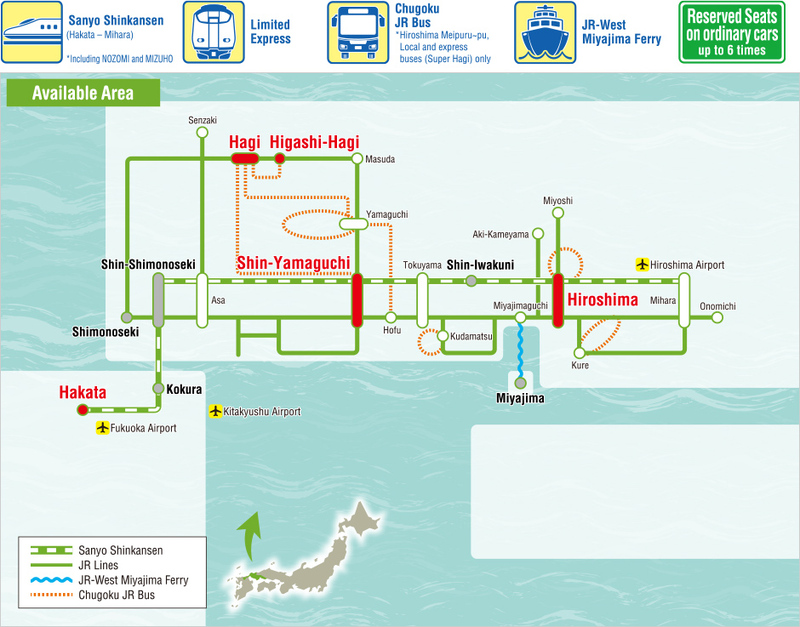 * 6 Only JR-WEST Miyajima Ferry is valid. * A separate seat reservation is needed for riding the SL Yamaguchi. ･ To change reservations for JR-WEST RAIL PASSES (including ICOCA and HARUKA) other than the Sanyo-San'in Area Pass, use the "Cancellation form"to cancel the reservation, and make a new reservation using the "Booking application form" at least 3 days in advance.